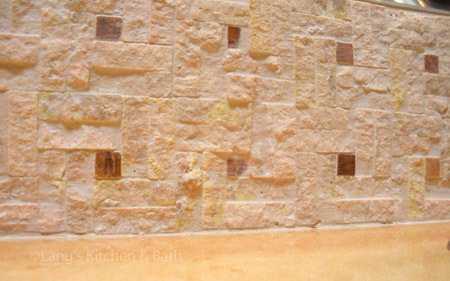 One of the latest trends in kitchen and bath design is to incorporate more textures into your design. Textures, along with colors and patterns, give a design the ability to be much more than just a functional space. As a complement to the practical elements of your design, textures are among the personal touches you add to your home, allowing you to inject a bit of your personality into your design. Textures help to stimulate the senses and tend to evoke certain emotions when you encounter them. From the time we are babies we may take comfort in a soft blanket or the feel of certain clothes, and over time we learn that different textures can affect us in different ways. So what does this have to do with bathroom design? The bathroom is an ideal space to incorporate textures as it tends to be a place we seek to unwind at the end of a long day or to feel refreshed and inspired at the beginning of your day. There are numerous textures to choose from and so many ways they can be incorporated into your new bathroom. For example, textured tiles can complement any bathroom from a rustic style to a contemporary bathroom. Natural materials such as pebbles, stone, or wood can bring the soothing elements of nature into a design, and create a relaxing space worthy of any spa. Glass, metal or metallic finishes, and exposed bricks are among the textures that can help you express your personal style. Elements of Nature: the Asian influenced bath incorporates the distinctive elements of feng shui and brings the relaxing and rejuvenating feeling of the outdoors into the design pictured to the right. The contrasting feel of river rocks used for the shower floor and the tub with the warm cedar wood surrounding the tub create an inviting atmosphere to soothe your body and mind. An Industrial Look: This bathroom design in New Hope, PA pictured below uses existing textures such as the exposed glass block, bricks, and pipes, combined with smooth tiles and a pebble shower floor to create a unique bathroom with a slightly industrial feel that is still warm and inviting. Rustic Feel: Reclaimed wood, natural wood with a slightly unfinished look, or a tile design with a coarse texture like the one pictured here evoke a distinctly rustic vibe for your bathroom. Smooth Contemporary: Texture and color combinations significantly influence the style of your bathroom, and also impact your frame of mind when you enter the room. 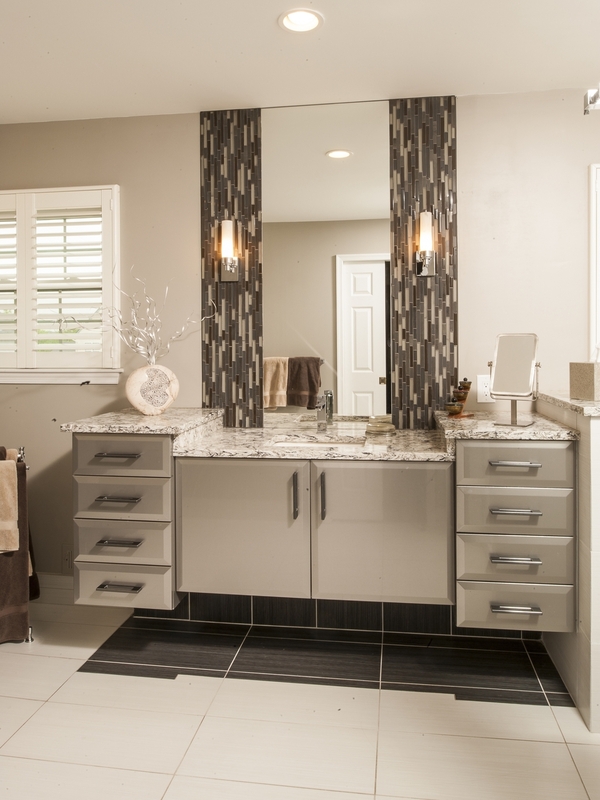 The contemporary bathroom design in Newtown, PA picture below immediately gives a clean, sleek feel to the room by combining smooth floor tiles and a vanity with a stainless steel appearance. The contrast of the mosaic accent tiles creates an eye-catching feature that adds another texture to complement the contemporary feel of this bathroom. Creating a new bathroom in your home, like any renovation, involves many practical choices, such as selecting a shower or bathtub, deciding whether to include one sink or two, and incorporating storage to meet all your requirements. While you are making these selections, it is the choices you make regarding color, texture, and patterns that bring your personality and style to your new space. For more inspiration in making these design decisions, visit our bathroom design gallery here or contact us to talk about your requirements.